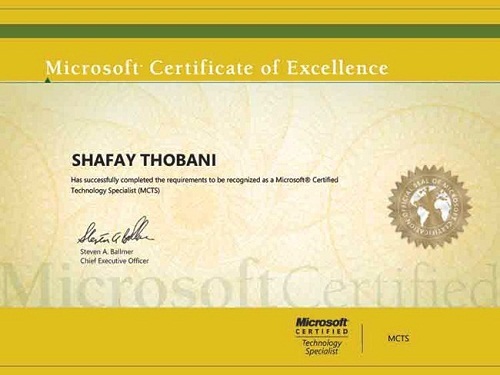 Eight year old Shafay Thobani is not an ordinary boy, because he is a Microsoft Certified Technology Specialist (MCTS) with extensive knowledge of information technology such as DNS and IP Addressing. Having being born in the age of technology, Shafay like any other child is brought up with gadgets, video games and computers as his first toys. Hailing from a family of Technologies specialist, Shafay began learning computers at the young age of 4. But simply learning how to turn ON and use the computer to play games was not enough for his father. He had greater plans for his futures. Shafay’s father saw a spark in his child and decided to start training him for the Microsoft Pro Matrix Test with the help of Microsoft Certified trainer. And Shafay’s hard work paid off when he secured 910 out of 1000 marks in the Pro Matrix Test for which he appeared on 9th April. Now at the age of 8, Shafays dreams are shaping a better future for Pakistan and he also feels a sense of responsibility after gaining popularity for his achievement. Shafays assisting his father in setting up an academy to train more children like himself for the Microsoft test. And together they hope for the development of Pakistan as more people are educated in the progressive field of technology. In the age of information technology young Shafay Thobani has proven hard work it is not by tough to achieve your dreams.